NARRATIVE: The Spokane City Fire Dept. responded firefighting apparatus and crews to 1403 E. Hartson Ave. at 10:56 on Sunday morning, May 25th, for a reported apartment fire. 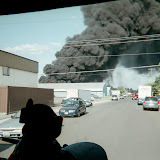 A large column of heavy black smoke was clearly visible to the firefighters as they approached the scene. Initial reports from the first-in fire company indicated smoke and flames were showing out of a south-facing 3rd floor window of a three story wood/frame apartment building consisting of 6 apartments. Fire Dept. Radio reports to the arriving fire companies indicated that there may be children inside of the apartment that was on fire. Until confirmation could be made that there were no victims inside the apartment all firefighting endeavors were focused on making an early, aggressive attack on the fire coupled with an intensive search for any possible victims. While these tactics were being undertaken other crews ventilated the apartment in order to remove the pent-up heat and toxic poisons that were rapidly accumulating inside. The removal of the heat and the toxins make the interior of the unit more tenable for the firefighters and assists them greatly by helping them complete their assignments in a timely manner. The primary and secondary search of the unit revealed that all occupants had exited safely to the outside. A woman and her young son were the tenants in the fire unit and they were finally located in a safe area away from any danger. The tenants of the apartment that burnt lost their pet hamsters in the fire. There were no reports of injuries to any of the occupants of the apartment complex or to any firefighters at the scene. The fire was controlled in about 20 minutes however the arduous task of overhauling the fire scene would take considerably more time. Fire crews and members of the Dept. 's Special Investigation Unit remained on scene until mid-afternoon. Nine pieces of firefighting apparatus and three Command Vehicles were dispatched to the fire delivering 34 firefighters to do the difficult work that every fire requires be done. Damage to the apartment where the fire occurred was substantial; the owners of the building will have to decide what rehabilitation efforts will be made to the building. The two units below the fire apartment were damaged by smoke and water to varying degrees, the Red Cross was on scene to assist the tenants of the three damaged units with temporary lodging. At the time of this media release the cause of the fire is still being investigated. DAMAGE EXTENT: One unit was a total loss, two other units below the fire apartment received varying degrees of smoke and/or water damage.